HANOVER, Mass. — Every so often, a new idea comes along, and the idea I’m about to describe might be Mike Baroni’s contribution to the industry. It’s not exactly a completely new idea, but his execution makes his business unique. In simple form, it dresses a drycleaning operation to look like a shiny, new retailer and sell products that align with dry cleaning. That is, anything to do with maintaining appearance. 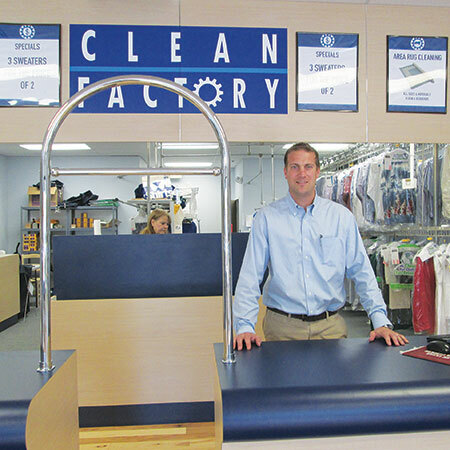 His new business, Clean Factory — with a cog logo in place of the letter ‘o’ — fits the bill as an upscale place to do business. The shop has polished hickory floors, LED spotlight lighting, soft music, and about 500 square feet of retail showroom. Clean Factory does its part in the processing end to turn out a quality product. It does many things that high-end cleaners do, such as clipping shirt sleeves together and stuffing blazers to give a full-bodied look. At the same time, the company maintains e-mail contact with its customers. To gain business, the company is embarking on a heavy marketing campaign. This includes Valpaks, ad books, supermarket receipts, Groupon, radio ads (Baroni is running ads voiced by him on local WATD radio), and e-mails that announce deals. After retail volume is going, Baroni will go after commercial and group retail volume. He says, “Both my manager, Tom Fitzgibbons, and I will approach law offices, banks, industrial companies, and offer to do their dry cleaning in return for gaining easy pickup and delivery service, becoming a VIP member and receiving a 10% discount. An alterations department will generate additional volume and secure business. The seamstress comes in three days a week from 9 to noon, but that time could increase. A “Tailoring by Elizabeth” sign hangs out front. Her seamstress skills will also help with the tuxedo trade. A nifty feature is the VIP bag, given free to customers. This is a suit cover bag that doubles as a dirty-laundry bag. It’s a twofer and is all the more useful. A showroom display highlights the two-use feature of the bag. To encourage volume, there are always specials going on, such as “Three sweaters for the price of two.” To that end, Clean Factory is open seven days a week with convenient hours. In addition, a 24-hour lockbox has been installed in front. This is Clean Factory’s first year of operation. Getting volume up to a profitable level takes time, while he attempts to remake the industry into his personal notion of what the drycleaning experience should be about. The innovator is one who is willing to do something different. It’s the way the industry advances.